The ultimate builder of larger, stronger, faster and more capable athletes. 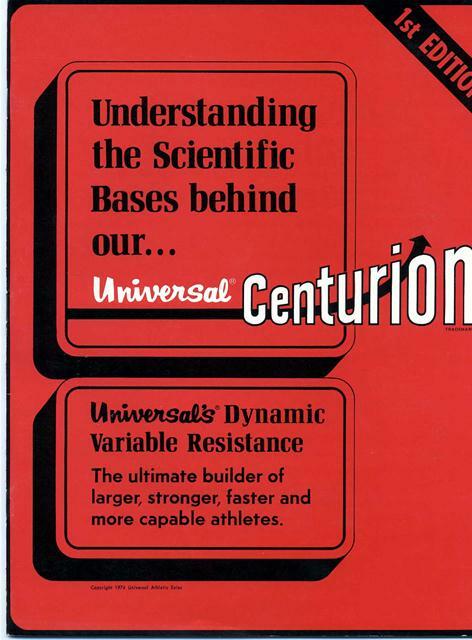 Universal is privileged to provide you with a selection of articles directly related to our persistent and uncompromising efforts to perfect variable resistance conditioning. Universal acknowledges its indebtedness to many individuals without whose help it is doubtful that a new and more effective method in conditioning could have been developed. 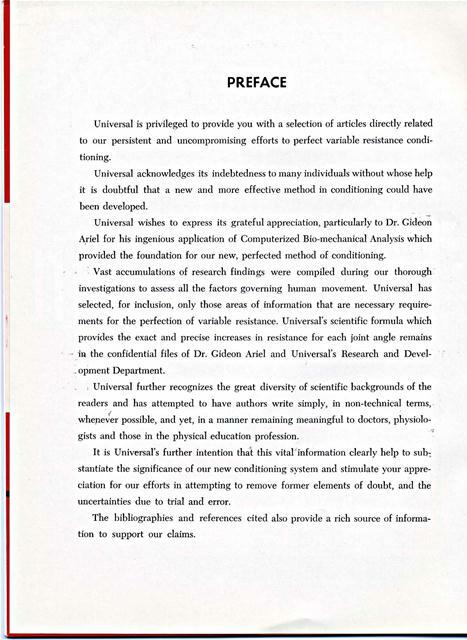 Universal wishes to express its grateful appreciation, particularly to Dr. Gideon Ariel for his ingenious application of Computerized Bio-mechanical Analysis which provided the foundation for our new, perfected method of conditioning. Vast accumulations of research findings were compiled during our thorough investigations to assess all the factors governing human movement. Universal has selected, for inclusion, only those areas of information that are necessary requirements for the perfection of variable resistance. 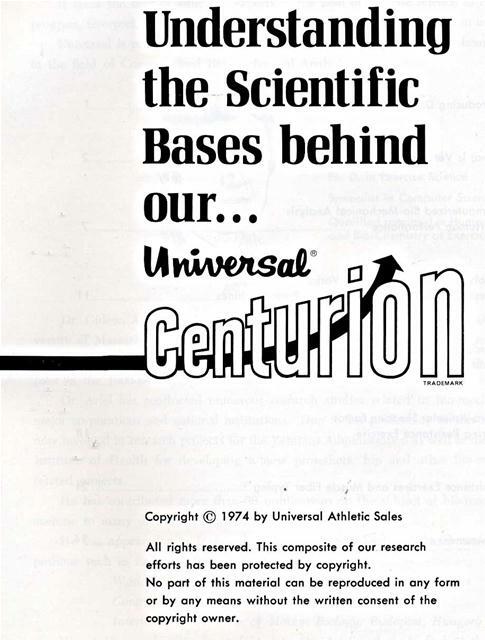 Universal's scientific formula which provides the exact and precise increases in resistance for each joint angle remains in the confidential files of Dr. Gideon Ariel and Universal's Research and Development Department. 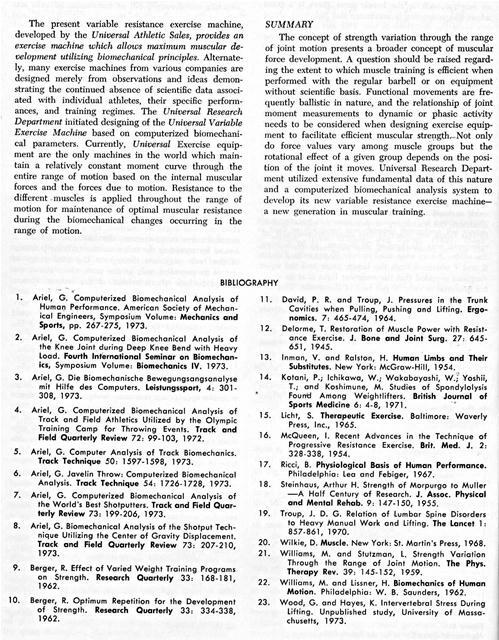 Universal further recognizes the great diversity of scientific backgrounds of the readers and has attempted to have authors write simply, in non-technical terms, whenever possible, and yet, in a manner remaining meaningful to doctors, physiologists and those in the physical education profession. It is Universal's further intention that this vital information clearly help to substantiate the significance of our new conditioning system and stimulate your appreciation for our efforts in attempting to remove former elements of doubt, and the uncertainties due to trial and error. The bibliographies and references cited also provide a rich source of information to support our claims. All rights reserved. This composite of our research efforts has been protected by copyright. No part of this material can be reproduced in any form or by any means without the written consent of the copyright owner. It takes the best of educated experts in the field of exercise science to be able to program, interpret, and assess the many laws and factors that govern human movement. Universal is proud to be able to introduce to you the world's most acclaimed expert in the field of Computerized Bio-mechanical Analysis. Qualified specialist in Human Factors and Bio-Chemistry of Exercise. Dr. Gideon Ariel is a Professor in the Department of Exercise Science at the University of Massachusetts. He has been involved with highly sophisticated research in the field of exercise for many years. He has also been involved in sports as a participant in the 1960-64 Olympic Games. Dr. Ariel has conducted numerous research studies related to bio-mechanics for major corporations and national institutions. Due to his proficiency in this field he is now involved in research projects for the Veterans Administration as well as the National Institute of Health for developing a new prosethetic hip and other bio-mechanical related projects. 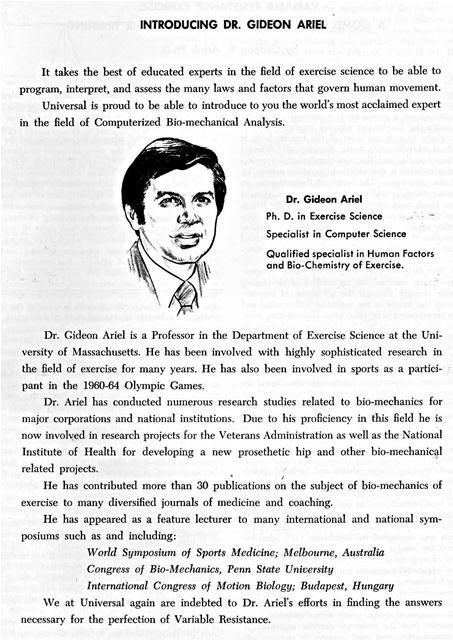 He has contributed more than 30 publications on the subject of bio-mechanics of exercise to many diversified journals of medicine and coaching. We at Universal again are indebted to Dr. Ariel's efforts in finding the answers necessary for the perfection of Variable Resistance. by Gideon B. Ariel, Ph.D. The relationship between resistance and muscle strength has been known for a long time. Muscular strength may be defined as the force a muscle group can exert against a resistance in a maximal effort; and, any motion by the human requires muscular involvement. Forty to sixty per cent of the human body is composed of contractile tissue forming 437 different voluntary muscle, and the most fundamental function of these muscles is the ability to produce motion by their own contraction. The action of these muscles on the bones which provides the leverage system, permits man to stand erect, carry out activities of daily living, and participate in athletic performances requiring optimal efficiency in muscular contraction and coordination. This motion of the musculoskeletal system is governed by both the strength of the muscles and skeletal structure. 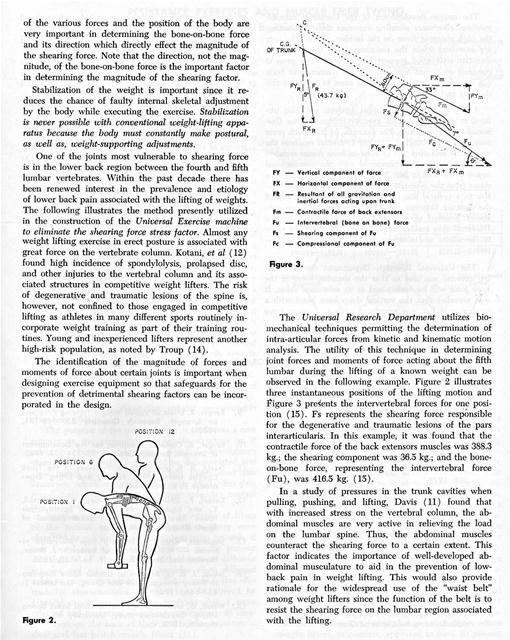 In 1948 Delorme (12) adopted the name "progressive resistance exercise" for his method of developing muscular strength through the utilization of counterbalancing the weight of the extremity with a cable and pulley arrangement and, thus, gave load-assisting exercise to muscle groups which would not perform antigravity motions. McQueen (16), distinguished between exercise regimes for producing muscle hypertrophy and for producing muscle power. He concluded that the number of repetitions for each set of exercise determines the different characteristics of the exercise. Based on evidence presented in these early studies, hundreds of investigations have been published relative to muscular development through resistance exercise with various methods being introduced. Techniques for muscular development include isotonic exercises; isometric exercises eccentric contraction technique; oxford technique; double and triple progressive systems; super sets system; isokenetic exercise system; chains and barbells; springs system and many others. Each system has been supported and refuted by numerous investigations. Some of the best research is that performed by Berger (9) who concluded that 6-7 repetitions 3 times a week is best for developing dynamic strength. Other excellent research was conducted by Steinhause (18) who emphasized the need to increase the intensity - not the amount of work-in order to develop maximum strength. 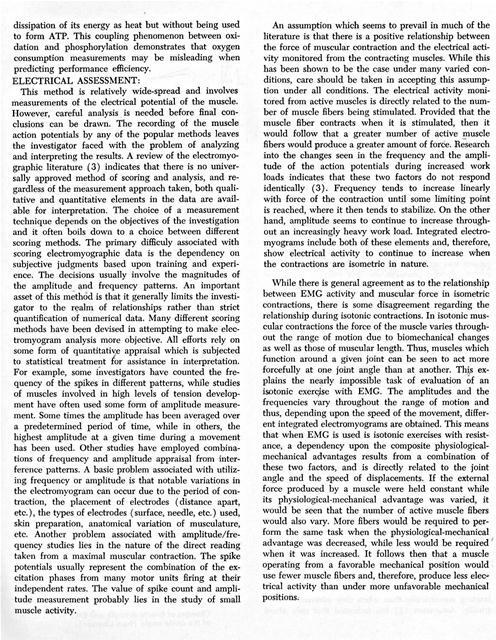 The intent of this paper is not to discuss the merits of various training methods or systems, but rather to discuss the biomeehanical principles that govern all types of resistance exercises, and to introduce a new concept in exercise equipment design which allows optimum training benefits from the resistance exercise regardless of the system used. Biomechanics is the science which investigates the effects of internal and external forces upon living bodies. When a person uses any resistance device whether it is a spring or a bar, there are two kinds of forces applied on this system. The internal forces produced by the muscular system and the external forces produced by the resistance device, in this case the spring or the bar. When considering any human force system, muscles, bones, and joints, as well as externally applied resistance, must be considered. Consideration of the magnitude of the externally applied resistance cannot be the only consideration in muscular training. Rather, the magnitude, action line, direction, and point of application are all four characteristics which must be considered to develop maximal muscular training routine. Physical educators and athletes deal constantly with muscle forces, both normal and super-normal, but how much is actually known about the actual magnitudes of these forces? The actual forces produced by individual muscles cannot be predicted easily because of the indeterminate influence of a number of physiological and mechanical factors. These include length-tension and force-velocity relationships (Wilkie, 1968), as well as, the location of the muscle attachments with respect to the joint. One way to determine the muscular involvement in the exercise is to refer to the moments, of force produced by all the muscles at the particular jint. It is well known in resistance exercise that there exists a "sticking point" during which the apparent resistance is at its maximum. However, the absolute muscular force is relatively constant and varies slightly depending on its force length relationship. This variability of muscle length is of no significance when performing exercises with heavy loads. If this is the case, why is there a "sticking point" in the bench press, for example, above which the weight becomes "light"? This phenomenon will be discussed in more detail. Figure 1. Illustration of the Principle of Moment. D1 (Lever arm 1) = 100 cm. D2 (Lever arm 2) = 200 cm. F1 (Weight of child 1) = 80 kg. In order to calculate F2 (Weight of child 2) we have to use the principle of Moment. Fl X D1 = 80 X 100 = 8000 Kg.cm.
? X 200 = 8000 ? = 8000/200 = 40 kg. Child 2 must weigh 40 kg. in order to balance child 1 who weighs 80 Kg. the moment of a force about any point is equal to the magnitude of the force multiplied by the perpendicular distance from the action line of the force to that point. This perpendicular distance from the force to the fulcrum is known as the lever arm of the force. D1 and D2 in Figure 1 are the lever arms associated with F1 and F2 (Force 1 and Force 2). A moment is the product of the force and the lever arm of the force. The product of D1 (distance) and F1 (force) in Figure 1 is the moment associated with the left side of the system, and the product of D2 and F2 is the moment associated with the right side of the system. The system in this figure is considered to be in equilibrium only if the moment on the left is equal to the moment on the right. This equality may result in several ways. For example, D1 might be smaller than D2, and F1 greater than F2, or possibly D1 is greater than D2, so that F2 must be greater than F1, or, D1, D2, F1, and F2 are equal. If we assume that D1 is 100 cm., D2 is 200 cm., and F2 equals 40 kg., then, to balance the system, F1 must equal 80 kg. since 200 X 40 must be equal to 100 X 80. 1. By changing the magnitude of the force. 2. By changing its distance from the fulcrum. In the case of the, teeter-totter, if two boys of equal weight are to balance one another, they must sit the same distance from the fulcrum of the board. If one boy plays with a child half his weight, this child must sit twice as far from the fulcrum in order to balance. M = 10 X 30/2 = 150 Kg. a load of 10 kg. (including the weight of the arm ), the muscle has to produce at least 150 kg. force. arm may be considered as the perpendicular distance from the tendon to the axis of the elbow joint (Figure 3). In this instance the lever arm is anatomically fixed, but the magnitude of the muscle force can be varied to alter the moment. Genetically a person may be born with a short forearm but with the normal distance for insertion of elbow flexors. Such a person may be extrenmely strong in arm wrestling because of the short resistance arm as compared with the force arm of a normal person. His absolute muscular strength is as normal as his opponent since it is merely the mechanical advantage that he has that allows him to win in arm wrestling. Suppose the biceps muscle supports the forearm with a weight of the forearm of 5 kg. and its center of gravity located 12 cm. from the elbow joint, and the biceps has a lever arm of approximately 3 cm. Then, the biceps must pull with a force of over 20 kg. in order to lift the arm. From these examples one observes that the biomechanical principle governing human motion is much more important than the classic length-tension principle. 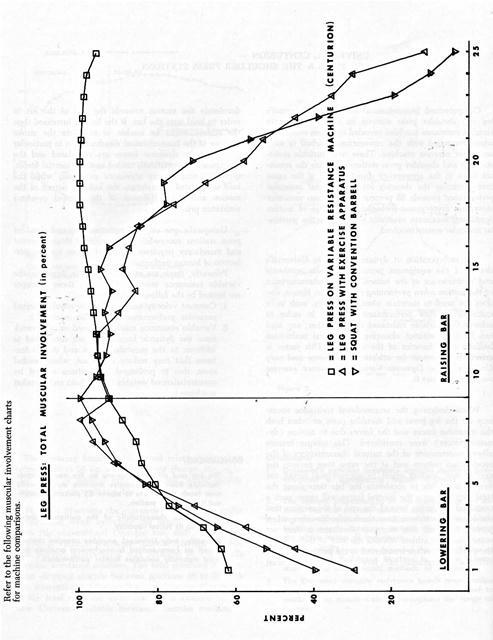 This is a description of the compensatory interaction between the length-tension curve and the leverage system in normal movement without great resistance (see Figure 4). However, when great resistance is applied to the body segment, the length-tension phenomenon no longer compensates for the changes in the leverage system. The biceps at various points of elbow flexion, shown variations in the lever arm (perpendicular distance frc the action line of flexion to elbow axis). The muscle leng as well as the lever arm changes throughout the rant of motion. (From Williams and Lissner, 1962). The changes are associated with different forces around tl elbow joint (bottom). Muscular force variation throughout the range of motic in the knee extension exercise. These variations are bil mechanically dependent. an exercise such as the bench press, there is a point where the resistance is maximum and below or above this point the resistance is less. This fact illustrates the important phenomenon that throughout an exercise stroke, the muscle is working at its maximum potential during a very small range of motion. [In order to resolve such a phenomenon, it is necessary to accommodate the biomechanical changes by varying the resistance.] To accomplish this, the concept of moment of force must be introduced into the exercise. As discussed previously, the moment of force is the product between the force arm of the muscle and the muscular force and indicates the dominant muscular involvement in the exercise. For example, in Figure 3, if the force arm is 2 cm. long and the resistance is 100 kg., then the muscle has to produce a 2 X 100 = 200 kg. cm moment in order to lift this resistance. However, if the force arm becomes 4 cm. only 50 kg. of force is needed from the muscle to resist 100 kg. In this latter case, the muscle does not work as hard and the training effect is less. Figure 3 illustrates the variability of moments in elbow flexion. In this figure one observes that maximum muscular involvement was obtained at 90 degrees. At 30 degrees, the elbow flexors were used to only 50 per cent. Figures 6 and 7 obtained from the bench press and the squat exercises revealed that the muscular force is at its greatest potential in only 30 per cent of the stroke. This fact demonstrates the vast waste found in traditional weight regimes since 70 per cent of the exercise is relatively useless. stant moment curve is attained. By having a constant moment curve in an exercise, the maximum mechanical means for receiving the full muscular training potential of the body segments throughout the total range of motion is provided and, at the same time, allows the natural ballistic characteristics of the motion. Hence, one does not need to maintain constant velocity, such as in isokinetic exercises, in order to achieve the variable resistance effect. Rather, any load can be used without changing the natural ballistic motion of the segment - a factor which is extremely important for athletic performances. To design the proper layout of exercise machines with the appropriate resistance lever arm in accordance with the requirements of kinesiology and the anatomy of man, it is necessary to determine the moment of force in each particular exercise and simultanously consider the muscular forces and the dynamic forces due to the motion. At present only Universal has utilized this type of data in the design of their exercise equipment. This information allowed development of apparatus which assigns different resistances throughout the range of motion in order to accommodate the biomechanical changes occurring during the exercise. When designing exercise machines for the development of muscular strength, there are two alternatives from which to choose if pertinent information is not available regarding some human performance characteristics. In the first place, one can pick answers out of the thin air; this obviously is a pretty risky business, although it is, unfortunately, a fairly common practice. Alternatively, it may be possible to carry out some research project to develop the needed information. Visual inspection can in no way ascertain the numerous forces or their direction acting on the individual. The present variable resistance exercise machine, developed by the Universal Athletic Sales, provides an exercise machine which allows maximum muscular development utilizing biomechanical principles. Alternately, many exercise machines from various companies are designed merely from observations and ideas demonstrating the continued absence of scientific data associated with individual athletes, their specific performances, and training regimes. 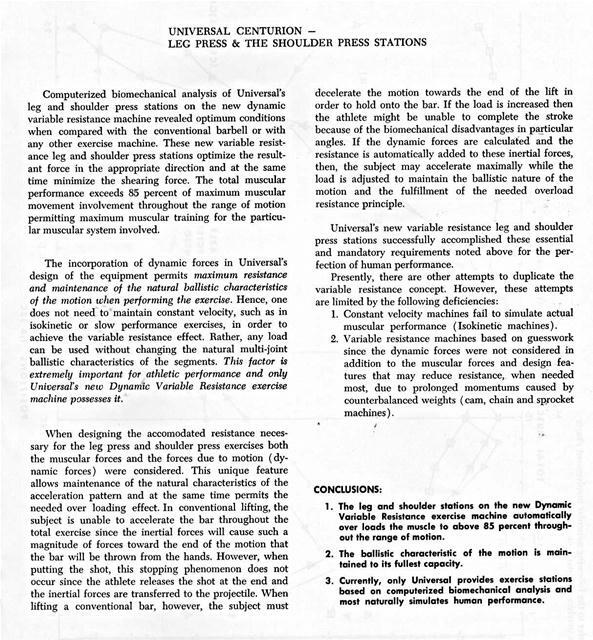 The Universal Research Department initiated designing of the Universal Variable Exercise Machine based on computerized biomechanical parameters. Currently, Universal Exercise equipment are the only machines in the world which maintain a relatively constant moment curve through the entire range of motion based on the internal muscular forces and the forces due to motion. Resistance to the different muscles is applied throughout the range of motion for maintenance of optimal muscular resistance during the biomechanical changes occurring in the range of motion. The concept of strength variation through the range of joint motion presents a broader concept of muscular force development. A question should be raised regarding the extent to which muscle training is efficient when performed with the regular barbell or on equipment without scientific basis. Functional movements are frequently ballistic in nature, and the relationship of joint moment measurements to dynamic or phasic activity needs to be considered when designing exercise equipment to facilitate efficient muscular strength. Not only do force values vary among muscle groups but the rotational effect of a given group depends on the position of the joint it moves. 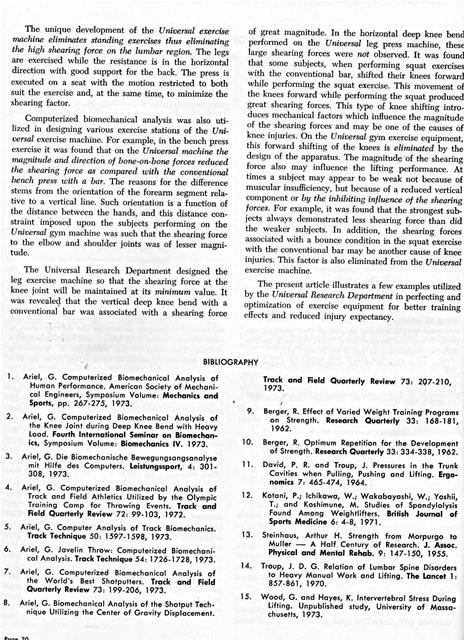 Universal Research Department utilized extensive fundamental data of this nature and a computerized bioniechanical analysis system to develop its new variable resistance exercise machinea new generation in muscular training. 1. Ariel, G. Computerized Biomechanical Analysis of Human Performance. American Society of Mechanical Engineers, Symposium Volume: Mechanics and Sports, pp. 267-275, 1973. 2. Ariel, G. Computerized Biomechanical Analysis of the Knee Joint during Deep Knee Bend with Heavy Load. Fourth International Seminar on Biomechanics, Symposium Volume: Biomechanics IV. 1973. 3. Ariel, G. Die Biomechanische Bewegungsangsanalyse mit Hilfe des Computers. Leistungssport, 4: 301308, 1973. 4. Ariel, G. Computerized Biomechanical Analysis of Track and Field Athletics Utilized by the Olympic Training Camp for Throwing Events. Track and Field Quarterly Review 72: 99-103, 1972. 5. Ariel, G. Computer Analysis of Track Biomechanics. Track Technique 50: 1597-1598, 1973. 6. Ariel, G. Javelin Throw: Computerized Biomechanical Analysis. Track Technique 54: 1726-1728, 1973. 7. Ariel, G. Computerized Biomechanical Analysis of the World's Best Shotputters. Track and Field Quarterly Review 73: 199-206, 1973. 8. Ariel, G. Biomechanical Analysis of the Shotput Technique Utilizing the Center of Gravity Displacement. 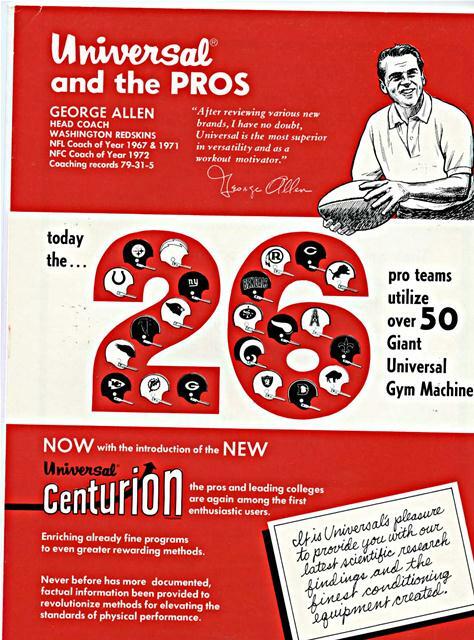 Track and Field Quarterly Review 73: 207-210, 1973. 9. Berger, R. Effect of Varied Weight Training Programs on Strength. Research Quarterly 33: 168-181, 1962. 10. Berger, R. Optimum Repetition for the Development of Strength. Research Quarterly 33: 334-338, 1962. 11. David, P. R. and Troup, J. Pressures in the Trunk Cavities when Pulling, Pushing and Lifting. Ergonomics. 7: 465-474, 1964. 12. Detorme, T. Restoration of Muscle Power with Resistance Exercise. J. Bone and Joint Surg. 27: 645651, 1945. 13. 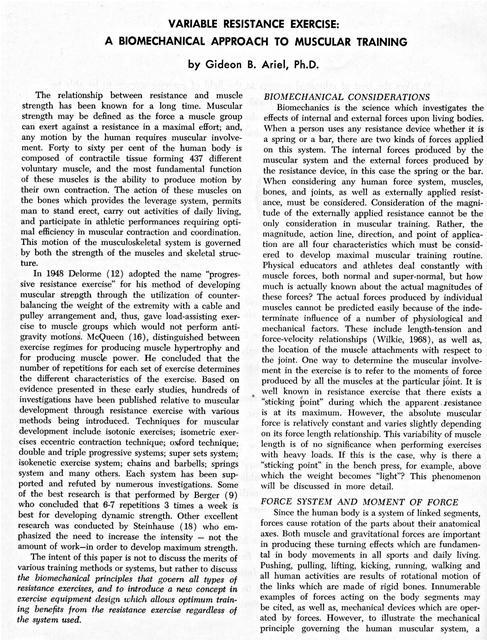 Inman, V. and Ralston, H. Human Limbs and Their Substitutes. New York: McGraw-Hill, 1954. 14. Kotani, P.; Ichikawa, W.; Wakabayashi, W.; Yoshii, T.; and Koshimune, M. Studies of Spondylolysis Found Among Weightlifters. 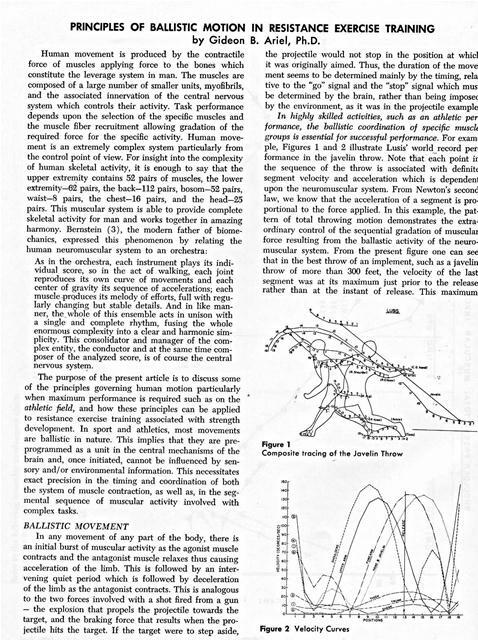 British Journal of Sports Medicine 6: 4-8, 1971. 15. Licht, S. Therapeutic Exercise. Baltimore: Waverly Press, Inc., 1965. 16. McQueen, I. Recent Advances in the Technique of Progressive Resistance Exercise. Brit. Med. J. 2: 328-338, 1954. 17. Ricci, B. Physiological Basis of Human Performance. Philadelphia: Lea and Febiger, 1967. 18. Steinhaus, Arthur H. Strength of Morpurgo to Muller -A Half Century of Research. J. Assoc. Physical and Mental Rehab. 9: 147-150, 1955. 19. Troup, J. D. G. Relation of Lumbar Spine Disorders to Heavy Manual Work and Lifting. The Lancet 1: 857-861, 1970. 20. Wilkie, D. Muscle. New York: St. Martin's Press, 1968. 21. Williams, M. and Stutzman, L. Strength Variation Through the Range of Joint Motion. The Phys. Therapy Rev. 39: 145-152, 1959. 22. 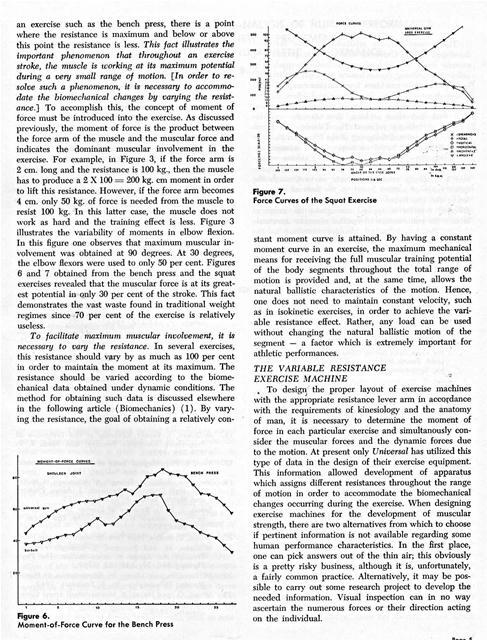 Williams, M. and Lissner, H. Biomechanics of Human Motion. Philadelphia: W. B. Sounders, 1962. 23. Wood, G. and Hayes, K. Intervertebral Stress During Lifting. Unpublished study, University of Massachusetts, 1973. The history of man is filled with evidence of his efforts to create new techniques and equipment which satisfactorily serve his purposes and to control more adequately the environment within which he lives and works. Over the years much of what physical educators, coaches and physical trainers knew about how man moved and performed was the result of visual observations and subject to subjective biases and opinions. Man's movements, especially in sport and physical training, are much more complicated than can be accurately analyzed by the human eye. A few typical questions might be posed which will illustrate what is meant by "taking human factor considerations into account" during the analysis of human performance. Such questions could include the following: which muscles are involved when executing a block in football? Which muscles need special strength development for each individual track and field event? To what extent does the bench press exercise develop the elbow extensors? Which muscular exercise would best suit the development of the knee extensors (quadriceps) with minimal shearing force at the joint? How much resistance should be varied throughout a range of exercise motion to obtain the most efficient exercise routine? The solutions to these and many other kinds of questions should be based on the availability of pertinent information about human capabilities and limitations as well as physiological, biological and biomechanical factors. The development of a body of information and principles that would be applicable to these and other problems is primarily dependent upon research. At present there is fairly substantial information available about sonic areas of human performance such as physiology of exercise. There is at least partial information about certain biomechanical principles; but in some areas the information available is quite limited, for example, in the design of exercise equipment for muscular development. mechanical technique enables optimum development of muscular strength and endurance for a particular sport or for everyday fitness. 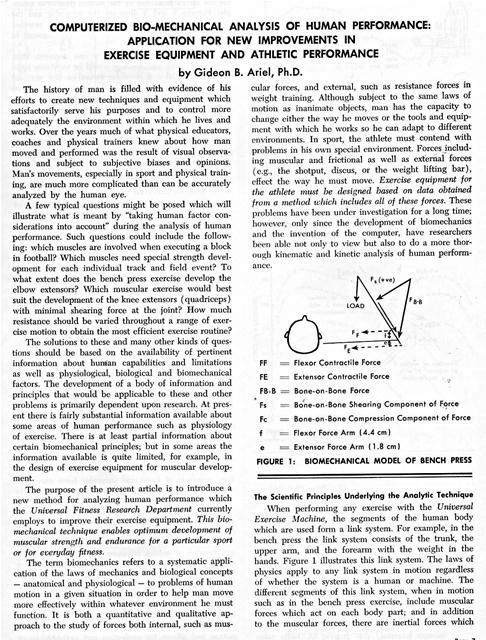 problems have been under investigation for a long time; however, only since the development of biomechanics and the invention of the computer, have researchers been able not only to view but also to do a more thorough kinematic and kinetic analysis of human performance. Principal forces in tests counterclockwise	torque,	muscle	pull (M) times lever arm (a), equals clockwise torque, tensiometer sling (F) times lever arm (b). 1. The force of gravity. are the forces produced by the motion itself. For example, Figures 2 and 3 illustrate the muscular and the inertial forces on the forearm during the curl exercise. These inertial forces would act upon any segment in motion in the human body. If the human body had only one segment, then designing an exercise machine would be very easy since only the inertial and muscular forces on that segment would act upon it. However, the human body, when performing physical exercise, has more than one segment in use even if some of the segments arc "fixed". For example, when a link system consists of two segments, such as the upper arm and the forearm, then gravity, centrifugal, and tangential forces act upon each segment with an additional 3 forces resulting from the influence of the first segment upon the second. Figure 3 illustrates all of the forces acting on 2 segments in motion. In some resistance exercises, as many as 9 segments are considered in the analysis. Universal laws affect a link system such that each segment in motion has the aforementioned three forces and additional forces due to the influence of segments on each other (Figure 3). In a link system of 7 segments such as in the shot-put throw, a total of 84 forces are involved in each sequence of the throw. An exercise machine developed from this type of information can maximize the training effect. 3. Measuring and utilizing anatomical data. analysis and quantifying human performance. 5. Interpretation of the results. Slow motion cinematography is used to record any desired motion and then special tracing equipment enables data to be processed directly by a high speed computer. Figure 4 illustrates the circuitry of the tracing equipment. The appropriate programming results in a segmental breakdown of information of the whole exercise motion. Data obtained includes the total body center of gravity, segment velocities and accelerations, and joint forces and moments of force. Figures 5, 6, 7, and 8 present computer graphic outputs of velocity, acceleration, moments of force and muscular force curves. A unique feature allows the interpretation of the data to show the significance of contribution of each body segment to the whole motion. 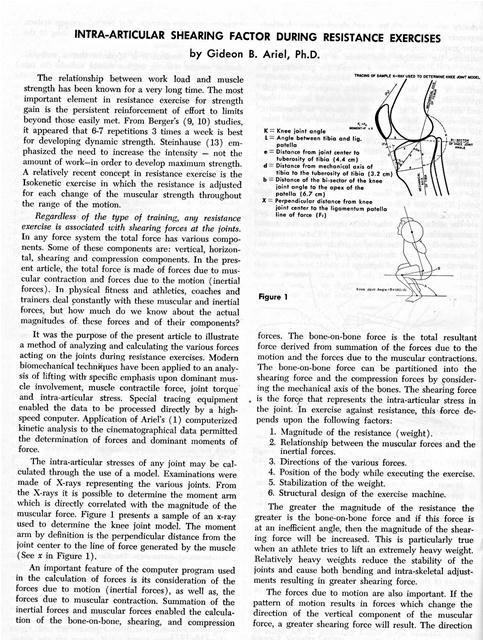 Other available information shows the magnitude of the muscle action at each joint; the vertical and horizontal forces at all joints; the magnitude of the shearing force at the joint; the timing or coordination of motion between the segments; and the differences due to body builds. The combination of the moments of force, the interrelated patterns of the body segments, and the exercise performed gives a measure for designing the exercise equipment and providing the load necessary at each angle of the joint for the particular body segment. - I st. SEG. 2nd. SEG. -- 3rd. SEG. ï¿½	AFTER - 131 SEG. ---- 2nd. SEC, -- Std. SEG. during the exercise itself (dynamic measurements). during the resistance exercise. This information allowed development of apparatus which assign different resistances throughout the range of motion in order to accommodate the biomechanical changes occurring during the exercise. When designing exercise machines for the development of muscular strength and efficiency, there are two alternatives from which to choose if pertinent information is not available regarding some human performance characteristics. In the first place one can pick answers out of thin air; this obviously is a pretty risky business, although it is, unfortunately, a fairly common practice. Alternatively, it may be possible to carry out some research project to develop the needed information; such a project can, of course, range from those of superficial nature to those of a broad-scale, even basicresearch, nature. Visual inspection can in no way ascertain the numerous forces or their direction acting on the individual. Consider the confidence which an engineer would inspire were he to look at both sides of the river and visually determine the details of the bridge to be constructed. vidual athlete and his specific performance. It is almost impossible to design an appropriate exercise machine from just an idea or observation. Whether or not an athlete is using his body efficiently on the correct equipment cannot be determined by visual observation alone. muscles is applied throughout the range of motion to maintain optimal muscular resistance throughout the biomechanical changes which take place in the range of motion. Thus, biomechanical parameters enabled development of the new variable resistance exercise machine to accomplish optimum muscular development for strength and speed. Inquiry and research continue to unfold new avenues for perfecting and optimizing training routines for each individual sport, such as track and field, or for team sports. 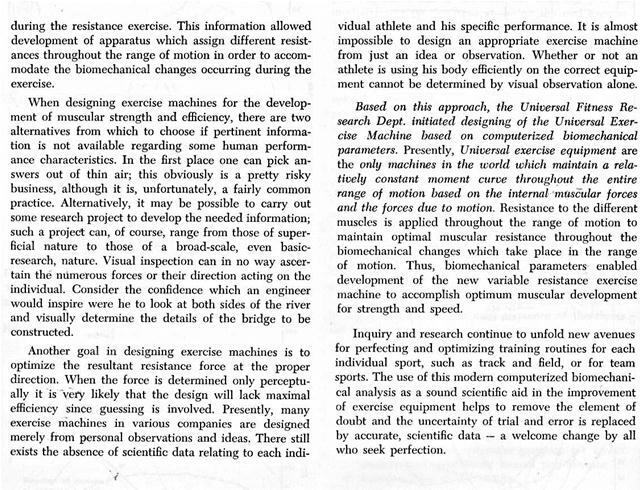 The use of this modern computerized biomechanical analysis as a sound scientific aid in the improvement of exercise equipment helps to remove the element of doubt and the uncertainty of trial and error is replaced by accurate, scientific data - a welcome change by all who seek perfection. The previous technical reports reveal the need for a variable resistance exercise machine which will maintain a relatively constant muscular movement curve throughout the entire range of motion based on the internal muscular forces and the forces due to motion. The previous data, also, revealed that there is a need to provide resistance to the different muscles throughout the range of motion in order to provide optimal muscular resistance throughout the biomechanical changes which take place, and, at the same time, to provide functional strength which is both ballistic in nature and involves multiple joint neuromuscular integration. Universal's computerized biomechanical testing of the bench press exercise revealed the exact forces necessary for the perfection of a variable resistance machine at this station. Table 1 presents the data from Universal's variable resistance machine including the force and the moment data, elbow angle (data withheld), shearing and compression force. Figure 1 illustrates the computer graphic output for the muscular force, moment of force and elbow angle curves. From Table 1 and Figure 1, it can be observed that the muscular force is maintained nearly constant throughout the range of motion. The increase in angular displacement towards the end of the motion reveals that the ballistic nature of the motion is maintained without the loss of muscular resistance - Universal's perfect muscular training effect. 9999, normal exit from prog. Time: 0.990 sec. Computer graphic output for the muscular force, moment of force, and elbow angle. The shearing force is maintained relatively constant between 40 to 20 kg. with no abrupt change, the probable cause of internal articular trauma, which usually occurred in conventional bar lifting. Figure 2 illustrates the comparison of total muscular involvement when executing the bench press exercise with the conventional Olympic bar, and on the new Universal variable resistance machine. It can be seen that marked improvement was obtained by Universal's variable resistance machine. The total muscular involvement dropped sharply between positions 18 to 30 with the conventional Olympic bar, while over 87 percent of the total muscular involvement was attained on the new Universal variable resistance exercise machine. 1. Universal's variable resistance exercise machine demonstrated a significantly higher muscular training effect. 2. The ballistic characteristic of the motion was not altered. The first exercise machine capable of maintaining the dynamic characteristics of the motion while insuring nearly maximum muscle efforts throughout the entire range of movement. 3. The shearing force data revealed the safety factor of the Variable Resistance Machine to be far greater than in the conventional methods of training. 4. The Universal variable resistance bench press station demonstrated a perfect automatic loading effect to enable total muscle training throughout the range of motion. Computerized biomechanical analysis of Universal's leg and shoulder press stations on the new dynamic variable resistance machine revealed optimum conditions when compared with the conventional barbell or with any other exercise machine. These new variable resistance leg and shoulder press stations optimize the resultant force in the appropriate direction and at the same time minimize the shearing force. The total muscular performance exceeds 85 percent of maximum muscular movement involvement throughout the range of motion permitting maximum muscular training for the particular muscular system involved. The incorporation of dynamic forces in Universal's design of the equipment permits maximum resistance and maintenance of the natural ballistic characteristics of the motion when performing the exercise. Hence, one does not need to maintain constant velocity, such as in isokinetic or slow performance exercises, in order to achieve the variable resistance effect. Rather, any load can be used without changing the natural multi-joint ballistic characteristics of the segments. This factor is extremely important for athletic performance and only Universal's new Dynamic Variable Resistance exercise machine possesses it. decelerate the motion towards the end of the lift in order to hold onto the bar. If the load is increased then the athlete might be unable to complete the stroke because of the biomechanical disadvantages in particular angles. If the dynamic forces are calculated and the resistance is automatically added to these inertial forces, then, the subject may accelerate maximally while the load is adjusted to maintain the ballistic nature of the motion and the fulfillment of the needed overload resistance principle. 1. Constant velocity machines fail to simulate actual muscular performance (Isokinetic machines). 2. Variable resistance machines based on guesswork since the dynamic forces were not considered in addition to the muscular forces and design features that may reduce resistance, when needed most, due to prolonged momentums caused by counterbalanced weights (cam, chain and sprocket machines). out the range of motion. 2. The ballistic characteristic of the motion is maintained to its fullest capacity. 3. Currently, only Universal provides exercise stations based on computerized biomechanical analysis and most naturally simulates human performance. Refer to the following muscular involvement charts for machine comparisons. 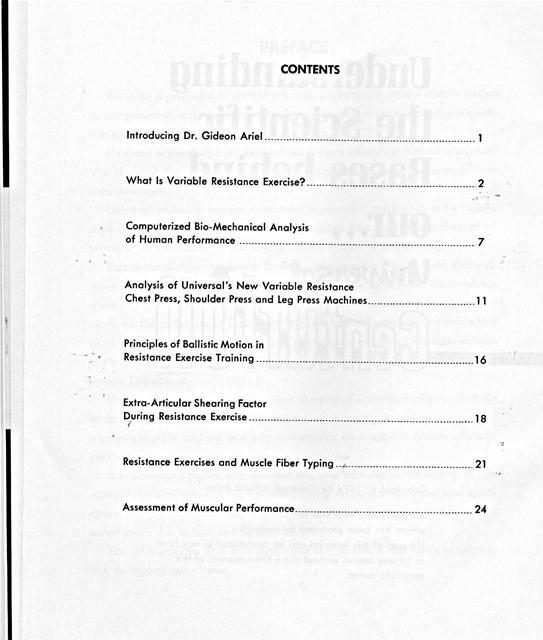 PRINCIPLES OF BALLISTIC MOTION IN RESISTANCE EXERCISE TRAINING by Gideon B. Ariel, Ph.D.
poser of the analyzed score, is of course the central nervous system. The purpose of the present article is to discuss some of the principles governing human motion particularly when maximum performance is required such as on the athletic field, and how these principles can be applied to resistance exercise training associated with strength development. In sport and athletics, most movements are ballistic in nature. This implies that they are preprogrammed as a unit in the central mechanisms of the brain and, once initiated, cannot be influenced by sensory and/or environmental information. This necessitates exact precision in the timing and coordination of both the system of muscle contraction, as well as, in the segmental sequence of muscular activity involved with complex tasks. velocity was achieved by rapid deceleration of other segments prior to release. Figure 3 illustrates a computer-graphic output of a baseball pitcher which demonstrates the multiple joint action of the various segments of the body. These segments are performing a ballistic movement governed by neuromuscular coordination. A good thrower requires a properly timed link system with respect to the coordination of accelerations and decelerations of all body segments in a ballistic sequence of action of the neuromuscular system from the fixed point through the last segment. A proper timing of body extremities aids in various human activities by altering the various resultant forces resulting in optimum performance. For example, in the case of a vertical jump, not only the muscular force is important but also attaining maximum deceleration of the arms just before the take-off aids the knee extensors in executing the jump. Thus, the ballistic timing of the neuromuscular system causing the deceleration of one body part may aid the movement of other body segments so that maximum performance can be achieved. These examples illustrate the importance of multiple joint motion in human activity and the necessity of precise neuromuscular timing for skilled activity. It was found that a characteristic pattern of motion is present during intentional movement of body segments with resistance. This pattern consists of reciprocally organized activity between the agonist and antagonist. These reciprocal activities occur in consistent temporal relationships with motion parameters, such as velocity, acceleration, and forces. capacity increases suggests that central nervous system, as well as the contractile tissue, is contributing to the component of training. 2. The resistance exercise should be performed with explosive repetitions. These two important factors imply that an isotonic form of muscular conditioning, utilizing multiple joint action, should be applied in preference to an isometric form. The exercise should simulate, as nearly as possible, the pattern of the activity itself. A single joint exercise can develop the muscular system for that particular segment with no relation to other segments. Persistent training of single joint exercise may cause the loss of efficiency of the ballistic action of human muscles - the most important element in multi-joint complex activities performed on the athletic field. However, single joint resistance exercises may be beneficial in therapeutic conditions for specific muscles in the body. In addition to the importance of performing resistance exercises using multiple joint motions, it is equally important that the speed with which the exercises are performed is considered. Repetitions should be performed as fast as possible with maximal mental concentration for recruitment of the maximum firing level of muscle fibers as required in maximal human performance. Universal's gym equipment was designed to provide a multiple joint motion and, simultaneously, to provide resistance throughout the range of motion. This allows strength development in each phase of the motion without disrupting the natural pattern of the movement. These applications of scientific principles to exercise equipment design allow maximum muscular development for increased performance in sport events. Human Performance. Mechanics and Sport. New York: ASME Press, 1973. 3. Berenstein, N. Some Emergent Problems of the Regulation of Motor Acts. The Co-Ordination and Regulation of Movements. New York: Pergamon, 1967. Overload Principle. 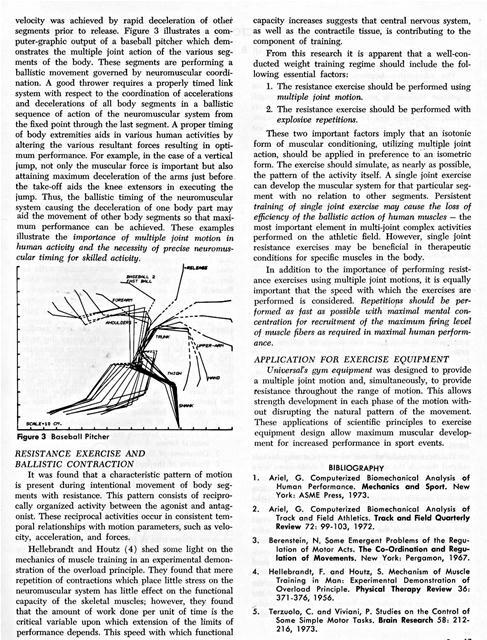 Physical Therapy Review 36: 371-376, 1956. INTRA-ARTICULAR SHEARING FACTOR DURING RESISTANCE EXERCISES by Gideon B. Ariel, Ph.D. The relationship between work load and muscle strength has been known for a very long time. The most important element in resistance exercise for strength gain is the persistent reinforcement of effort to limits beyond those easily met. From Berger's (9, 10) studies, it appeared that 6-7 repetitions 3 times a week is best for developing dynamic strength. Steinhause (13) emphasized the need to increase the intensity - not the amount of work-in order to develop maximum strength. A relatively recent concept in resistance exercise is the Isokenetic exercise in which the resistance is adjusted for each change of the muscular strength throughout the range of the motion. Regardless of the type of training, any resistance exercise is associated with shearing forces at the joints. In any force system the total force has various components. Some of these components are: vertical, horizontal, shearing and compression components. In the present article, the total force is made of forces due to muscular contraction and forces due to the motion (inertial forces). In physical fitness and athletics, coaches and trainers deal constantly with these muscular and inertial forces, but how much do we know about the actual magnitudes of these forces and of their components? It was the purpose of the present article to illustrate a method of analyzing and calculating the various forces acting on the joints during resistance exercises. Modern biomechanical techniques have been applied to an analysis of lifting with specific emphasis upon dominant muscle involvement, muscle contractile force, joint torque and intra-articular stress. Special tracing equipment enabled the data to be processed directly by a highspeed computer. 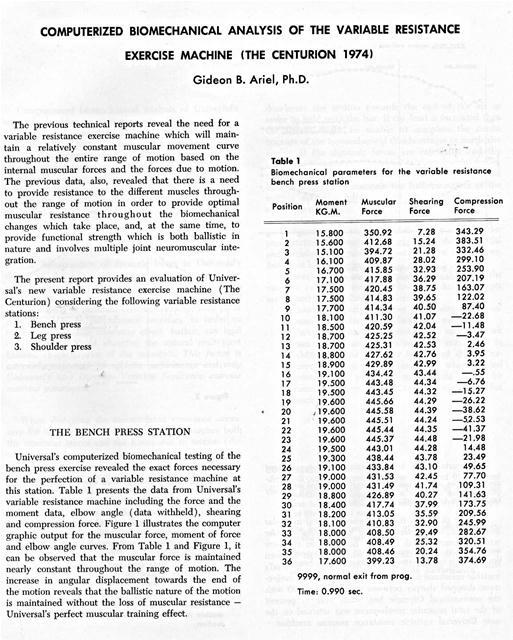 Application of Ariel's (1) computerized kinetic analysis to the cinematographical data permitted the determination of forces and dominant moments of force. The intra-articular stresses of any joint may be calculated through the use of a model. Examinations were made of X-rays representing the various joints. From the X-rays it is possible to determine the moment arm which is directly correlated with the magnitude of the muscular force. Figure 1 presents a sample of an x-ray used to determine the knee joint model. The moment arm by definition is the perpendicular distance from the joint center to the line of force generated by the muscle (See x in Figure 1). 1. Magnitude of the resistance (weight). 3. Directions of the various forces. 4. Position of the body while executing the exercise. 5. Stabilization of the weight. 6. Structural design of the exercise machine. The greater the magnitude of the resistance the greater is the bone-on-bone force and if this force is at an inefficient angle, then the magnitude of the shearing force will be increased. This is particularly true when an athlete tries to lift an extremely heavy weight. Relatively heavy weights reduce the stability of the joints and cause both bending and intra-skeletal adjustments resulting in greater shearing force. of the various forces and the position of the body are very important in determining the bone-on-bone force and its direction which directly effect the magnitude of the shearing force. Note that the direction, not the magnitude, of the bone-on-bone force is the important factor in determining the magnitude of the shearing factor. Stabilization of the weight is important since it reduces the chance of faulty internal skeletal adjustment by the body while executing the exercise. Stabilization is never possible with conventional weight-lifting apparatus because the body must constantly make postural, as well as, weight-supporting adjustments. One of the joints most vulnerable to shearing force is in the lower back region between the fourth and fifth lumbar vertebrates. Within the past decade there has been renewed interest in the prevalence and etiology of lower back pain associated with the lifting of weights. The following illustrates the method presently utilized in the construction of the Universal Exercise machine to eliminate the shearing force stress factor. Almost any weight lifting exercise in erect posture is associated with great force on the vertebrate column. Kotani, et al (12) found high incidence of spondylolysis, prolapsed disc, and other injuries to the vertebral column and its associated structures in competitive weight lifters. The risk of degenerative and traumatic lesions of the spine is, however, not confined to those engaged in competitive lifting as athletes in many different sports routinely incorporate weight training as part of their training routines. Young and inexperienced lifters represent another high-risk population, as noted by Troup (14). The identification of the magnitude of forces and moments of force about certain joints is important when designing exercise equipment so that safeguards for the prevention of detrimental shearing factors can be incorporated in the design. The Universal Research Department utilizes biomechanical techniques permitting the determination of intra-articular forces from kinetic and kinematic motion analysis. The utility of this technique in determining joint forces and moments of force acting about the fifth lumbar during the lifting of a known weight can be observed in the following example. Figure 2 illustrates three instantaneous positions of the lifting motion and higure 3 prc4ents the intervertebral forces for one position (15). Fs represents the shearing force responsible for the degenerative and traumatic lesions of the pars interarticularis. In this example, it was found that the contractile force of the back extensors muscles was 388.3 kg. ; the shearing component was 36.5 kg. ; and the boneon-bone force, representing the intervertebral force (Fu), was 416.5 kg. (15). In a study of pressures in the trunk cavities when pulling, pushing, and lifting, Davis (11) found that with increased stress on the vertebral column, the abdominal muscles are very active in relieving the load on the lumbar spine. Thus, the abdominal muscles counteract the shearing force to a certain extent. This factor indicates the importance of well-developed abdominal musculature to aid in the prevention of lowhack pain in weight lifting. This would also provide rationale for the widespread use of the "waist belt" among weight lifters since the function of the belt is to resist the shearing force on the lumbar region associated with the lifting. The unique development of the Universal exercise machine eliminates standing exercises thus eliminating the high shearing force on the lumbar region. The legs are exercised while the resistance is in the horizontal direction with good support for the back. The press is executed on a seat with the motion restricted to both suit the exercise and, at the same time, to minimize the shearing factor. Computerized biomechanical analysis was also utilized in designing various exercise stations of the Universal exercise machine. For example, in the bench press exercise it was found that on the Universal machine the magnitude and direction of bone-on-bone forces reduced the shearing force as compared with the conventional bench press with a bar. The reasons for the difference steins from the orientation of the forearm segment relative to a vertical line. Such orientation is a function of the distance between the hands, and this distance constraint imposed upon the subjects performing on the Universal gym machine was such that the shearing force to the elbow and shoulder joints was of lesser magnitude. of great magnitude. In the horizontal deep knee bend performed on the Universal leg press machine, these large shearing forces were not observed. It was found that some subjects, when performing squat exercises with the conventional bar, shifted their knees forward while performing the squat exercise. This movement of the knees forward while performing the squat produced great shearing forces. This type of knee shifting introduces mechanical factors which influence the magnitude of the shearing forces and may be one of the causes of knee injuries. On the Universal gym exercise equipment, this forward shifting of the knees is eliminated by the design of the apparatus. The magnitude of the shearing force also may influence the lifting performance. At times a subject may appear to be weak not because of muscular insufficiency, but because of a reduced vertical component or by the inhibiting influence of the shearing forces. For example, it was found that the strongest subjects always demonstrated less shearing force than did the weaker subjects. In addition, the shearing forces associated with a bounce condition in the squat exercise with the conventional bar may be another cause of knee injuries. This factor is also eliminated from the Universal exercise machine. The present article illustrates a few examples utilized by the Universal Research Department in perfecting and optimization of exercise equipment for better training effects and reduced injury expectancy. 8. Ariel, G. Biomechanical Analysis of the Shotput Technique Utilizing the Center of Gravity Displacement. 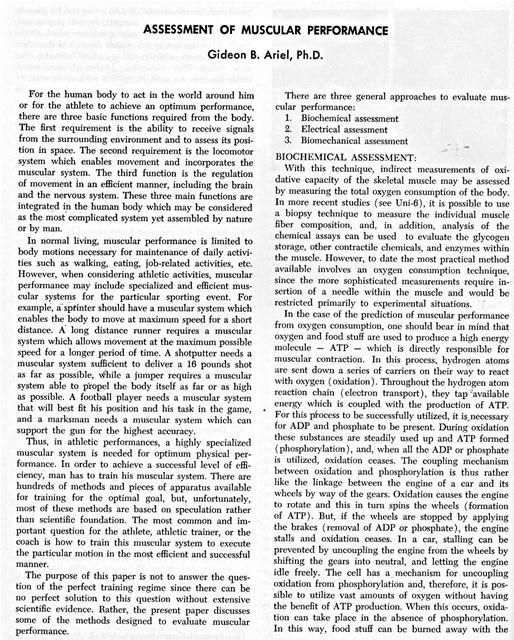 Track and Field Quarterly Review 73: 207-210, 1973. 11. David, P. R. and Troup, J. Pressures in the Trunk Cavities when Pulling, Pushing and Lifting. 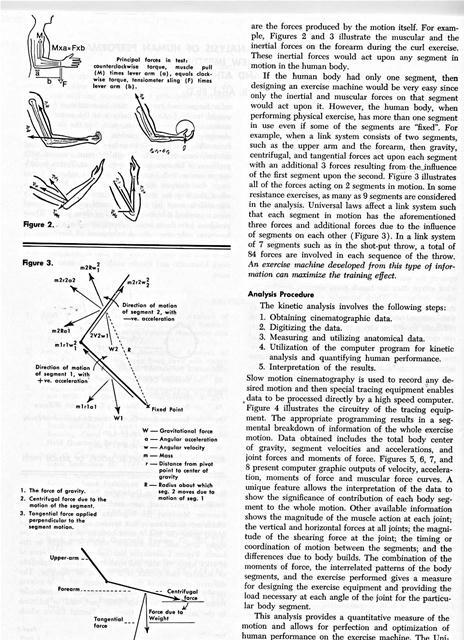 Ergonomics 7: 465-474, 1964. 12. Kotani, P.; Ichikawa, W.; Wakabayashi, W.; Yoshii, T.; and Koshimune, M. Studies of Spondylolysis Found Among Weightlifters. 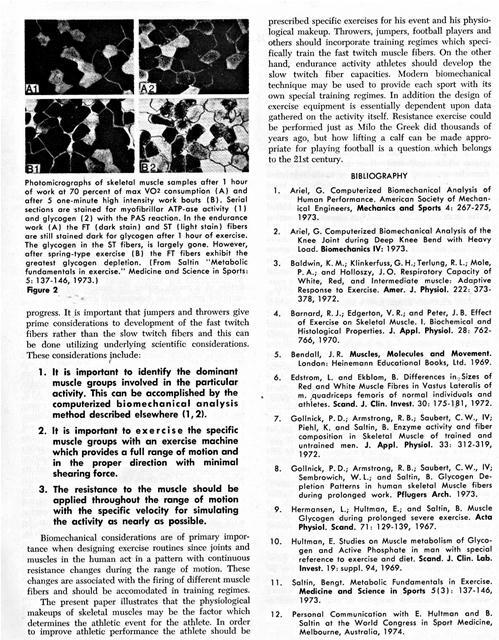 British Journal of Sports Medicine 6: 4-8, 1971. 13. Steinhaus, Arthur H. Strength from Morpurgo to Muller - A Half Century of Research. J. Assoc. Physical and Mental Rehab. 9: 147-150, 1955. 14. Troup, J. D. G. Relation of Lumbar Spine Disorders to Heavy Manual Work and Lifting. The Lancet 1: 857-861, 1970. 15. Wood, G. and Hayes, K. Intervertebral Stress During Lifting. Unpublished study, University of Massachusetts, 1973. The effect of resistance exercises upon muscular strength development and muscle hypertrophy has been known for a long time. In ancient Greece, Milo the Greek wrestler used progressive resistance exercises to improve his strength. His original method consisted of lifting a calf each day until its full growth, and, this method provides the first example of progressive resistance exercises. The 434 voluntary muscles in man constitute 40 to 60 percent of his total body weight. These muscles are responsible for human motion, which is the most funamental function of the musculoskeletal system. The action of muscles on the bones provides a mechanical system of levers which permits man to carry out all his physical activities, and, the efficiency of this musculoskeletal system is, to a great extent governed by the strength of the muscles. The typical skeletal muscle, which is responsible for the movement of limbs and the total body, consists of a bundle of long fibers, each up to 0.01 centimeters in diameter and running the entire length of the muscle, joined at each end by tendons to the bone or organ they are responsible for moving. Movement takes place as a result of the contraction of these fibers, which may shorten by as much as sixty percent of their resting length, pulling the bone with them as they do so. Each fiber, in turn, may be seen under the microscope to consist of a set of long, parallel myofibrils, each about .0001 centimeters in diameter. The myofibrils contain the contractile material of the muscle. Figure 1 illustrates the muscle at different magnification. The physiology of muscular contraction is rather complicated and beyond the scope of the present paper. However, detailed discussions about this subject are available elsewhere (5). The purpose of the present paper is to discuss a new concept in the physiology of muscle structure as it relates to human performance. Swedish investigators observed that muscle fibers could be differentiated into slow twitch fibers and fast twitch fibers, and this discovery, which occurred in the early 1970's, has profound implications for undertaking muscular control and exercise. Previous investigators identified two types of fibers in the human muscle. Originally, these fibers were classified as red and white fibers, but, more recently, it was found that there are differences in the percent distribution of these fibers both between different muscles and within the same muscles when different subjects were compared (6). Saltin noted that the oxidative characteristics of muscle can be altered by physical conditioning, and he proposes that a more relevant and important classification schema is to identify fibers on the basis of their contractile properties - slow and fast twitch muscle fibers (11). ï¿½	ï¿½ ï¿½ . .
Schematic representation of the structure of muscle fiber. of each fiber type. These differences in relative fiber composition observed between groups of athletes may be, according to Saltin, due to natural selection and may suggest that the talent of a particular athlete may be determined by muscle biopsy before his commitment to the particular athletic event. 1. Fibers with a high or intermediate concentration of oxidative enzymes and a low concentration of phosphorylase and myofibrilar ATP-ase are generally called Type I or Red Fibers (Slow twitch fibers). 2. Fibers with a low concentration of Oxidative enzymes and a high concentration of phosphorylase and myofibrillar ATP-ase are generally called Type II or White fibers (Fast twitch fibers). endurance type activity such as in long distance running, the body selects different muscle fibers as compared with explosive athletic events such as in throwing or jumping. In some athletic performances, such as in football, both types of fibers are equally important, depending on the task. In kicking, for example, the fast twitch fibers are the most important in executing the intense kick where in carrying the ball across the field a combination of fast and slow twitch fibers is important. The important question for the coach or the physical trainer is to be able to devise a training routine which can develop a specific muscle group for a specific activity. that high muscular strength is well correlated with large cross-sectional area of the fast twitch fibers and the size of the slow twitch fibers seemed to be unrelated to muscular strength. It was found by various investigators (9) that differences in muscular training intensities resulted in muscular training of the different fibers. The primary source of energy for muscular contraction is glycogen. With depletion of glycogen under different exercise regimes, it is possible to identify which fibers are involved in the activity. It was found for example (9) that glycogen depletion was different following exercise as compared with that produced by electrical stimulation. The explanation of this phenomenon was given by Gollnick et al (7) : the supramaximal voltages used in experiments with electrical stimulation are intended to activate all the fibers of a muscle. Under these conditions fibers with low oxidative capacity, such as the fast twitch fibers, will consume their glycogen faster than the slow twitch fibers. This finding was observed by Kugelbcrg and Edstrom (11). During normal activity, fibers are probably recruited selectively in the manner suggested by Henneman and Olson (11). At low to moderate work intensity, oxidative fibers (ST) are probably used to a greater extent and the glycolytic fibers (FT) added only when the work load exceeds the capacity of the oxidative fibers (ST). research, it was found that the intensity of the exercise is the prime factor in recruiting the fast twitch fibers. work (A) the FT (dark stain) and ST (light stain) fibers are still stained dark for glycogen after 1 hour of exercise. progress. It is important that junipers and throwers give prime considerations to development of the fast twitch fibers rather than the slow twitch fibers and this can be done utilizing underlying scientific considerations. 1. It is important to identify the dominant muscle groups involved in the particular activity. This can be accomplished by the computerized biomechanical analysis method described elsewhere (1, 2). 2. It is important to e x e r c i s e the specific muscle groups with an exercise machine which provides a full range of motion and in the proper direction with minimal shearing force. the activity as nearly as possible. Biomechanical considerations are of primary importance when designing exercise routines since joints and muscles in the human act in a pattern with continuous resistance changes during the range of motion. These changes are associated with the firing of different muscle fibers and should be accomodated in training regimes. gathered on the activity itself. Resistance exercise could be performed just as Milo the Greek did thousands of years ago, but how lifting a calf can be made appropriate for playing football is a question. which belongs to the 21st century. 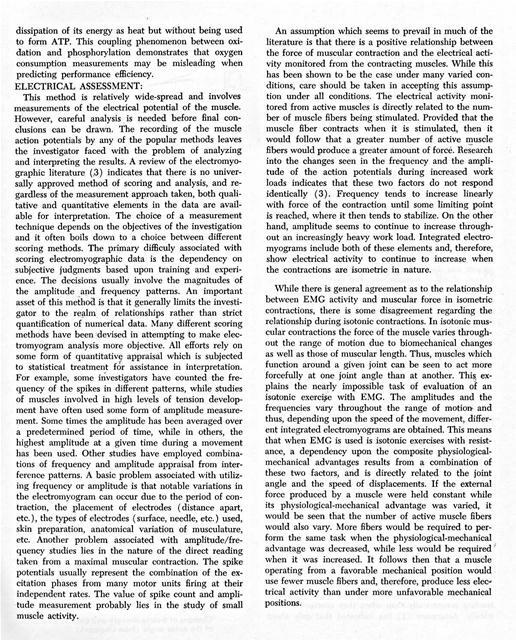 I . Ariel, G. Computerized Biomechanical Analysis of Human Performance. American Society of Mechanical Engineers, Mechanics and Sports 4: 267-275, 1973. 2. Ariel, G. Computerized Biomechanical Analysis of the Knee Joint during Deep Knee Bend with Heavy Load. 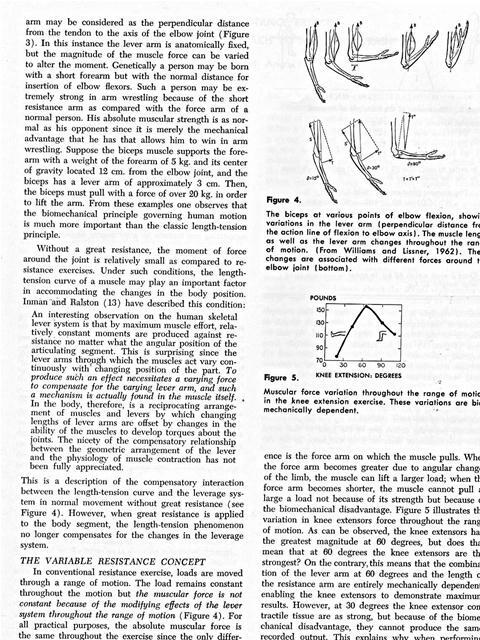 Biomechanics IV: 1973. 3. Baldwin, K. M.; Klinkerfuss, G. H.; Terlung, R. L.; Mole, P. A.; and Holloszy, J. O. Respiratory Capacity of White, Red, and Intermediate muscle: Adaptive Response to Exercise. Amer. J. Physiol. 222: 373378, 1972. 4. Barnard, R. J.; Edgerton, V. R.; and Peter, J. B. Effect of Exercise on Skeletal Muscle. I. Biochemical and Histological Properties. J. Appl. Physiol. 28: 762766, 1970. 5. Bendall, J. R. Muscles, Molecules and Movement. London: Heinemann Educational Books, Ltd. 1969. 6. Edstrom, L. and Ekblom, B. Differences in Sizes of Red and White Muscle Fibres in Vastus Lateralis of m. quadriceps femoris of normal individuals and athletes. Scand. J. Clin. Invest. 30: 175-181, 1972. 7. Gollnick, P. D.; Armstrong, R. B.; Saubert, C. W., IV; Piehl, K. and Saltin, B. Enzyme activity and fiber composition in Skeletal Muscle of trained and untrained men. J. Appl. Physiol. 33: 312-319, 1972. 8. Gollnick, P. D.; Armstrong, R. B.; Saubert, C. W., IV; Sembrowich, W. L.; and Saltin, B. Glycogen Depletion Patterns in human skeletal Muscle fibers during prolonged work. Pflugers Arch. 1973. 9. Hermansen, L.; Hultman, E.; and Saltin, B. Muscle Glycogen during prolonged severe exercise. Acta Physiol. Scand. 71: 129-139, 1967. 10. Hultman, E. Studies on Muscle metabolism of Glycogen and Active Phosphate in man with special reference to exercise and diet. Scand. J. Clin. Lab. Invest. 19: suppl. 94, 1969. 11. Saltin, Bengt. Metabolic Fundamentals in Exercise. 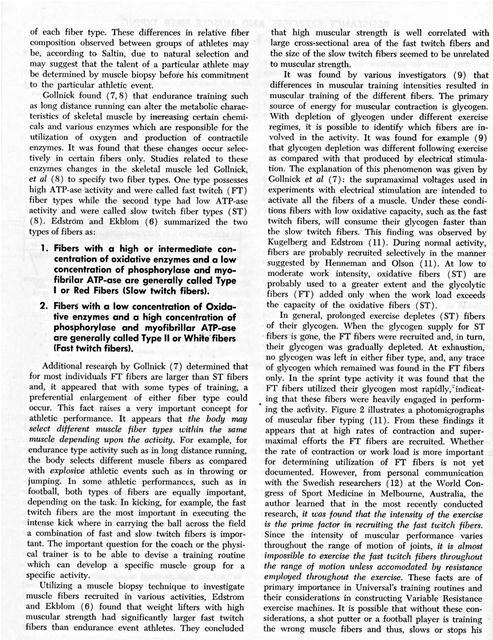 Medicine and Science in Sports 5(3): 137-146, 1973. 12. Personal Communication with E. Hultman and B. Saltin at the World Congress in Sport Medicine, Melbourne, Australia, 1974. For the human body to act in the world around him or for the athlete to achieve an optimum performance, there are three basic functions required from the body. The first requirement is the ability to receive signals from the surrounding environment and to assess its position in space. The second requirement is the locomotor system which enables movement and incorporates the muscular system. The third function is the regulation of movement in an efficient manner, including the brain and the nervous system. These three main functions are integrated in the human body which may be considered as the most complicated system yet assembled by nature or by man. In normal living, muscular performance is limited to body motions necessary for maintenance of daily activities such as walking, eating, job-related activities, etc. However, when considering athletic activities, muscular performance may include specialized and efficient muscular systems for the particular sporting event. For example, a splinter should have a muscular system which enables the body to move at maximum speed for a short distance. A long distance runner requires a muscular system which allows movement at the maximum possible speed for a longer period of time. A shotputter needs a muscular system sufficient to deliver a 16 pounds shot as far as possible, while a jumper requires a muscular system able to propel the body itself as far or as high as possible. A football player needs a muscular system that will best fit his position and his task in the game, and a marksman needs a muscular system which can support the gun for the highest accuracy. Thus, in athletic performances, a highly specialized muscular system is needed for optimum physical performance. In order to achieve a successful level of efficiency, man has to train his muscular system. There are hundreds of methods and pieces of apparatus available for training for the optimal goal, but, unfortunately, most of these methods arc based on speculation rather than scientific foundation. The most common and important question for the athlete, athletic trainer, or the coach is how to train this muscular system to execute the particular motion in the most efficient and successful manner. The purpose of this paper is not to answer the question of the perfect training regime since there can be no perfect solution to this question without extensive scientific evidence. Rather, the present paper discusses some of the methods designed to evaluate muscular performance. With this technique, indirect measurements of oxidative capacity of the skeletal muscle may be assessed by measuring the total oxygen consumption of the body. In more recent studies (see Uni-6 ), it is possible to use a biopsy technique to measure the individual muscle fiber composition, and, in addition, analysis of the chemical assays can be used to evaluate the glycogen storage, other contractile chemicals, and enzymes within the muscle. 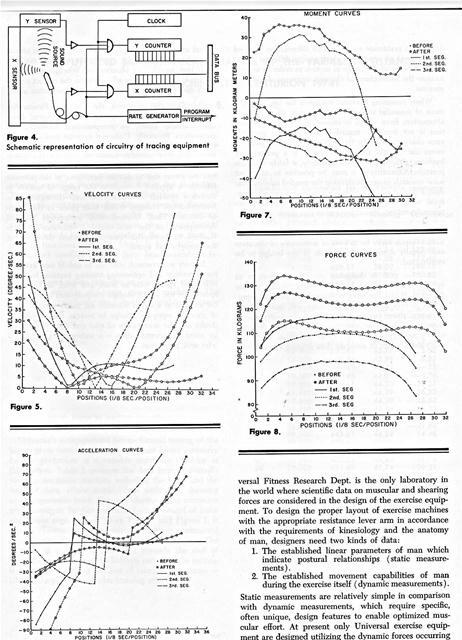 However, to date the most practical method available involves an oxygen consumption technique, since the more sophisticated measurements require insertion of a needle within the muscle and would be restricted primarily to experimental situations. dissipation of its energy as heat but without being used to form ATP. This coupling phenomenon between oxidation and phosphorylation demonstrates that oxygen consumption measurements may be misleading when predicting performance efficiency. This method is relatively wide-spread and involves measurements of the electrical potential of the muscle. However, careful analysis is needed before final conclusions can be drawn. The recording of the muscle action potentials by any of the popular methods leaves the investigator faced with the problem of analyzing and interpreting the results. A review of the electromyographic literature (3) indicates that there is no universally approved method of scoring and analysis, and regardless of the measurement approach taken, both qualitative and quantitative elements in the data are available for interpretation. The choice of a measurement technique depends on the objectives of the investigation and it often boils down to a choice between different scoring methods. The primary difficuly associated with scoring electromyographic data is the dependency on subjective judgments based upon training and experience. The decisions usually involve the magnitudes of the amplitude and frequency patterns. An important asset of this method is that it generally limits the investigator to the realm of relationships rather than strict quantification of numerical data. 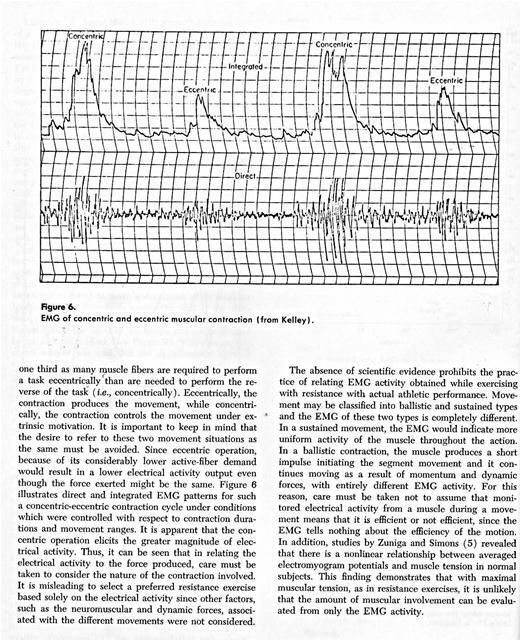 Many different scoring methods have been devised in attempting to make electromyogram analysis more objective. All efforts rely on some form of quantitative appraisal which is subjected to statistical treatment for assistance in interpretation. For example, some investigators have counted the frequency of the spikes in different patterns, while studies of muscles involved in high levels of tension development have often used some form of amplitude measurement. Some tines the amplitude has been averaged over a predetermined period of time, while in others, the highest amplitude at a given time during a movement has been used. Other studies have employed combinations of frequency and amplitude appraisal from interference patterns. A basic problem associated with utilizing frequency or amplitude is that notable variations in the clectromyogram can occur due to the period of contraction, the placement of electrodes (distance apart, etc. ), the types of electrodes (surface, needle, etc.) used, skin preparation, anatomical variation of musculature, etc. Another problem associated with amplitude/frequency studies lies in the nature of the direct reading taken from a maximal muscular contraction. The spike potentials usually represent the combination of the excitation phases from many motor units firing at their independent rates. The value of spike count and amplitude measurement probably lies in the study of small muscle activity. An assumption which seems to prevail in much of the literature is that there is a positive relationship between the force of muscular contraction and the electrical activity monitored from the contracting muscles. While this has been shown to be the case under many varied conditions, care should be taken in accepting this assumption under all conditions. The electrical activity monitored from active muscles is directly related to the number of muscle fibers being stimulated. Provided that the muscle fiber contracts when it is stimulated, then it would follow that a greater number of active muscle fibers would produce a greater amount of force. Research into the changes seen in the frequency and the amplitude of the action potentials during increased work loads indicates that these two factors do not respond identically (3). Frequency tends to increase linearly with force of the contraction until some limiting point is reached, where it then tends to stabilize. On the other hand, amplitude seems to continue to increase throughout an increasingly heavy work load. Integrated electromyograms include both of these elements and, therefore, show electrical activity to continue to increase when the contractions are isometric in nature. While there is general agreement as to the relationship between EMG activity and muscular force in isometric contractions, there is some disagreement regarding the relationship during isotonic contractions. In isotonic muscular contractions the force of the muscle varies throughout the range of motion due to biomechanical changes as well as those of muscular length. Thus, muscles which function around a given joint can be seen to act more forcefully at one joint angle than at another. This explains the nearly impossible task of evaluation of an isotonic exercise with EMG. The amplitudes and the frequencies vary throughout the range of motion and thus, depending upon the speed of the movement, different integrated electromyograms are obtained. This means that when EMG is used is isotonic exercises with resistance, a dependency upon the composite physiologicalmechanical advantages results from a combination of these two factors, and is directly related to the joint angle and the speed of displacements. If the external force produced by a muscle were held constant while its physiological-mechanical advantage was varied, it would be seen that the number of active muscle fibers would also vary. More fibers would be required to perform the same task when the physiological-mechanical advantage was decreased, while less would be required when it was increased. It follows then that a muscle operating from a favorable mechanical position would use fewer muscle fibers and, therefore, produce less electrical activity than under more unfavorable mechanical positions. In normal living, muscular performance is limited to body motions necessary for maintenance of daily activities such as walking, eating, job-related activities, etc. However, when considering athletic activities, muscular performance may include specialized and efficient muscular systems for the particular sporting event. For example, a sprinter should have a muscular system which enables the body to move at maximum speed for a short distance. A long distance runner requires a muscular system which allows movement at the maximum possible speed for a longer period of time. A shotputter needs a muscular system sufficient to deliver a 16 pounds shot as far as possible, while a juniper requires a muscular system able to propel the body itself as far or as high as possible. A football player needs a muscular system that will best fit his position and his task in the game, and a marksman needs a muscular system which can support the gun for the highest accuracy. Thus, in athletic performances, a highly specialized muscular system is needed for optimum physical performance. In order to achieve a successful level of efficiency, man has to train his muscular system. There are hundreds of methods and pieces of apparatus available for training for the optimal goal, but, unfortunately, most of these methods are based on speculation rather than scientific foundation. The most common and important question for the athlete, athletic trainer, or the coach is how to train this muscular system to execute the particular motion in the most efficient and successful manner. With this technique, indirect measurements of dative capacity of the skeletal muscle may be asses by measuring the total oxygen consumption of the be In more recent studies (see Uni-6 ), it is possible to a biopsy technique to measure the individual mu: fiber composition, and, in addition, analysis of chemical assays can be used to evaluate the glyco; storage, other contractile chemicals, and enzymes wit the muscle. However, to elate the most practical meth available involves an oxygen consumption techniel since the more sophisticated measurements require sertion of a needle within the muscle and would restricted primarily to experimental situations. This method is relatively wide-spread and involves measurements of the electrical potential of the muscle. However, careful analysis is needed before final conclusions can be drawn. The recording of the muscle action potentials by any of the popular methods leaves the investigator faced with the problem of analyzing and interpreting the results. A review of the electromyographic literature (3) indicates that there is no universally approved method of scoring and analysis, and regardless of the measurement approach taken, both qualitative and quantitative elements in the data are available for interpretation. The choice of a measurement technique depends on the objectives of the investigation and it often boils down to a choice between different scoring methods. The primary difficuly associated with scoring electromyographic data is the dependency on subjective judgments based upon training and experience. The decisions usually involve the magnitudes of the amplitude and frequency patterns. An important asset of this method is that it generally limits the investigator to the realm of relationships rather than strict quantification of numerical data. Many different scoring methods have been devised in attempting to make electromyogram analysis more objective. All efforts rely on some form of quantitative appraisal which is subjected to statistical treatment for assistance in interpretation. For example, some investigators have counted the frequency of the spikes in different patterns, while studies of muscles involved in high levels of tension development have often used some form of amplitude measurement. Some times the amplitude has been averaged over a predetermined period of time, while in others, the highest amplitude at a given time during a movement has been used. Other studies have employed combinations of frequency and amplitude appraisal from interference patterns. A basic problem associated with utilizing frequency or amplitude is that notable variations in the electromyogram can occur due to the period of contraction, the placement of electrodes (distance apart, etc. ), the types of electrodes (surface, needle, etc.) used, skin preparation, anatomical variation of musculature, etc. Another problem associated with amplitude/frequency studies lies in the nature of the direct reading taken from a maximal muscular contraction. The spike potentials usually represent the combination of the excitation phases from many motor units firing at their independent rates. The value of spike count and amplitude measurement probably lies in the study of small muscle activity. While there is general agreement as to the relationship between EMG activity and muscular force in isometric contractions, there is some disagreement regarding the relationship during isotonic contractions. In isotonic muscular contractions the force of the muscle varies throughout the range of motion due to biomechanical changes as well as those of muscular length. Thus, muscles which function around a given joint can be seen to act more forcefully at one joint angle than at another. This, explains the nearly impossible task of evaluation of an isotonic exerciee with EMG. The amplitudes and the frequencies vary throughout the range of motion and thus, depending upon the speed of the movement, different integrated electromyograms are obtained. This means that when EMG is used is isotonic exercises with resistance, a dependency upon the composite physiologicalmechanical advantages results from a combination of these two factors, and is directly related to the joint angle and the speed of displacements. If the external force produced by a muscle were held constant while its physiological-mechanical advantage was varied, it would be seen that the number of active muscle fibers would also vary. More fibers would be required to perform the same task when the physiological-mechanical advantage was decreased, while less would be required when it was increased. It follows then that a muscle operating from a favorable mechanical position would use fewer muscle fibers and, therefore, produce less electrical activity than under more unfavorable mechanical positions. 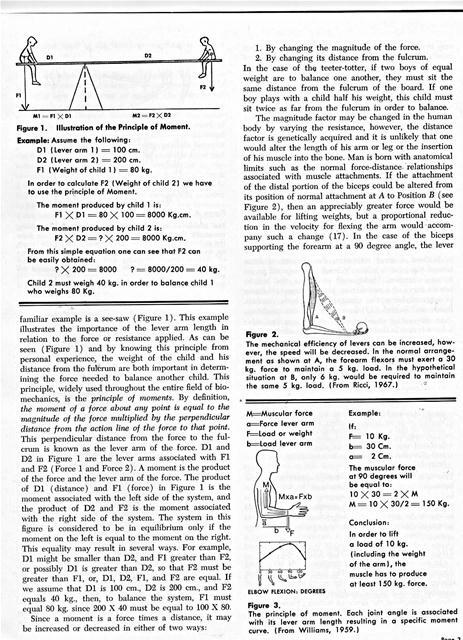 Liberson (4) found that a high strength joint position of a muscle (dynamometric value) at a certain angle of the joint may indicate a mechanical advantage of the muscle pull rather than its intrinsic maximal efficiency. For instance, the contraction of the biceps, characterized by a certain dynamometric reading with the elbow at 90 degrees, may be associated with a lower voluntary activation of the muscle than when the same dynamometric reading is obtained with the elbow at 180 degrees. In the former case, the biceps pulls almost perpendicularly to the radius, while, in the later, its pull is almost parallel to the long axis of this bone. Obviously, the dynamometric data may express both the influence of the muscle length and the mechanical advantage when the corresponding joint is at a certain angle. Obviously, the EMG level will depend upon the muscular contraction efficiency. It was found also that the shape of the muscle while contracting relates to the EMG activity (4). Figure 1 demonstrates the EMG activity as it relates to different joint angles. Liberson (4) also found that the central nervous system regulation of EMG during the maximal effort of the subject was dependent on such factors as fatigue, suggestion, divided attention, etc. For example, when the individual is asked to make a maximum effort with his biceps during an isometric contraction and at the same time press upon the table with his elbow, the EMG is higher than if the effect of the biceps was not facilitated by an additional effort (see Figure 4). 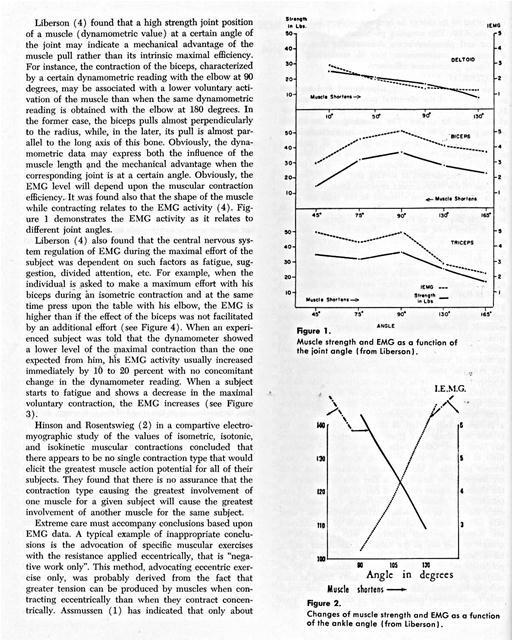 When an experienced subject was told that the dynamometer showed a lower level of the maximal contraction than the one expected from him, his EAMG activity usually increased immediately by 10 to 20 percent with no concomitant change in the dynamometer reading. When a subject starts to fatigue and shows a decrease in the maximal voluntary contraction, the EMG increases (see Figure 3). 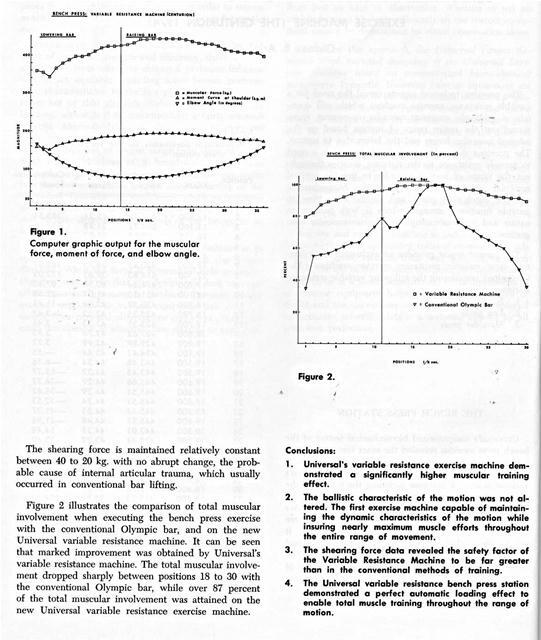 Hinson and Rosentswieg (2) in a compartive electromyographic study of the values of isometric, isotonic, and isokinetic muscular contractions concluded that there appears to be no single contraction type that would elicit the greatest muscle action potential for all of their subjects. They found that there is no assurance that the contraction type causing the greatest involvement of one muscle for a given subject will cause the greatest involvement of another muscle for the same subject. 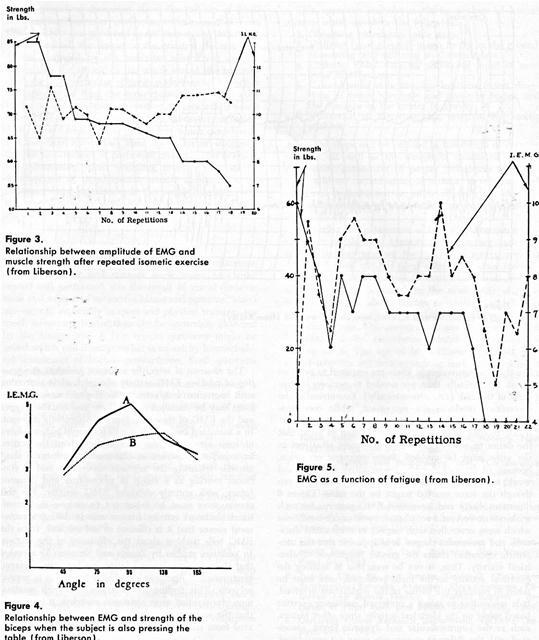 Muscle strength and EMG as a function of the joint angle (from Liberson). Changes of muscle strength and EMG as a function of the ankle angle (from Liberson). 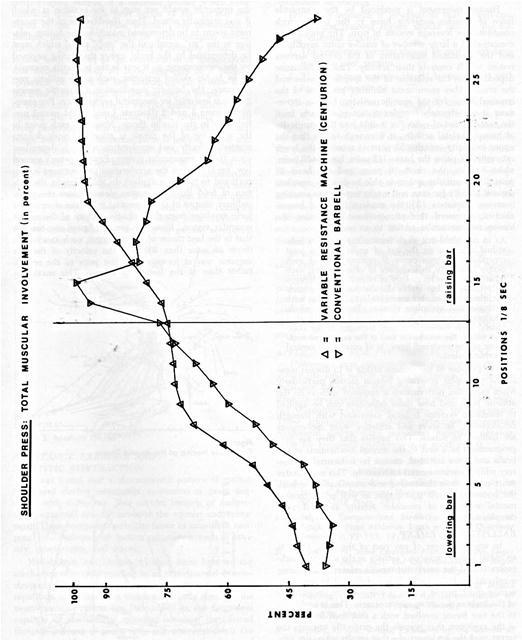 Relationship between amplitude of EMG and muscle strength after repeated isometic exercise (from Liberson). EMG as a function of fatigue (from Liberson). Relationship between EMG and strength of the biceps when the subject is also pressing the table (from Liberson). EMG of concentric and eccentric muscular contraction (from Kelley). one third as many muscle fibers are required to perform a task eccentricallytthan are needed to perform the reverse of the task (i.e., concentrically). Eccentrically, the contraction produces the movement, while concentrically, the contraction controls the movement under extrinsic motivation. It is important to keep in mind that the desire to refer to these two movement situations as the same must be avoided. Since eccentric operation, because of its considerably lower active-fiber demand would result in a lower electrical activity output even though the force exerted might be the same. Figure 6 illustrates direct and integrated EMG patterns for such a concentric-eccentric contraction cycle under conditions which were controlled with respect to contraction durations and movement ranges. It is apparent that the concentric operation elicits the greater magnitude of electrical activity. Thus, it can be seen that in relating the electrical activity to the force produced, care must be taken to consider the nature of the contraction involved. It is misleading to select a preferred resistance exercise based solely on the electrical activity since other factors, such as the neuromuscular and dynamic forces, associated with the different movements were not considered. The absence of scientific evidence prohibits the practice of relating EMG activity obtained while exercising with resistance with actual athletic performance. Movement may be classified into ballistic and sustained types and the EMC of these two types is completely different. In a sustained movement, the EMG would indicate more uniform activity of the muscle throughout the action. In a ballistic contraction, the muscle produces a short impulse initiating the segment movement and it continues moving as a result of momentum and dynamic forces, with entirely different EMG activity. For this reason, care must be taken not to assume that monitored electrical activity from a muscle during a movement means that it is efficient or not efficient, since the EMG tells nothing about the efficiency of the motion. In addition, studies by Zuniga and Simons (5) revealed that there is a nonlinear relationship between averaged electromyogram potentials and muscle tension in normal subjects. This finding demonstrates that with maximal muscular tension, as in resistance exercises, it is unlikely that the amount of muscular involvement can be evaluated from only the EMG activity. The preceding discussion about the validity of EMG in assessing muscular performance tells us that even though EMG is a good tool to indicate motor unit firing, it does not tell the trainer or the coach if the muscular forces produced by the muscular contraction are the forces that the athlete or the coach would like to maximize for the particular athletic performance. A further limitation stems from the experimental situation of electrodes, wires, and various recording devices which would necessarily restrict such studies to a laboratory situation. EMG cannot measure the parameters which can identify the muscular forces and their directions or determine the net involvement of particular muscles. This is essential information when designing exercise routines for development of those specific muscle groups with the necessary force magnitudes in the proper direction, with the proper velocity, and with the proper adjustment of resistance to simulate the activity. forces and what is the net involvement of each muscular group? 2. Which muscles need special strength development for each individual track and field event? 3. To what extent does the bench press exercise develop the elbow extensors and in what direction? shearing force at the joint? Biomechanics refers to a systematic application of the laws of mechanics and biological concepts to problems of human motion in a given situation in order to help man move more effectively within whatever environment he must function. It is both a quantitative and a qualitative approach to the study of forces both internal, such as muscular forces, and external, such as resistance forces in weight training. 2. Utilizing force plates to assess forces on the ground. the location of the center of gravity. All of the steps can be utilized in the design of exercise routines, as well as the design of associated exercise equipment; assessment of proper techniques for particular athletic or industrial situations; development of improved performance or safety devices; etc. A more detailed discussion of the method involved is available elsewhere (6). Biomechanical assessment of human performance continues to unfold new avenues for perfecting and optimizing training routines for individual sports, such as track and field, and for team sports, including football. The solutions to athletic, industrial, or even medical questions should be based on the availability of pertinent information about human capabilities and limitations, as well as physiological, biological, and biomechanical factors. The answers to these questions cannot be obtained by electromographical or biochemical studies alone. The use of biomechanical analysis as a sound scientific aid in approaching such problems helps to remove the element of doubt and the uncertaintly of trial and error. 1. 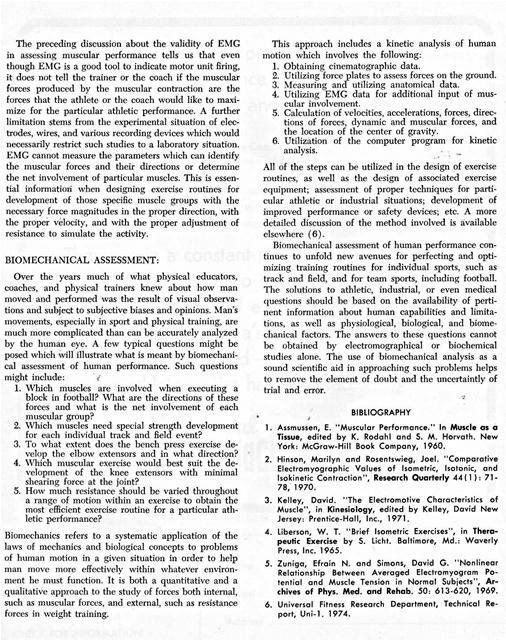 Assmussen, E. "Muscular Performance." 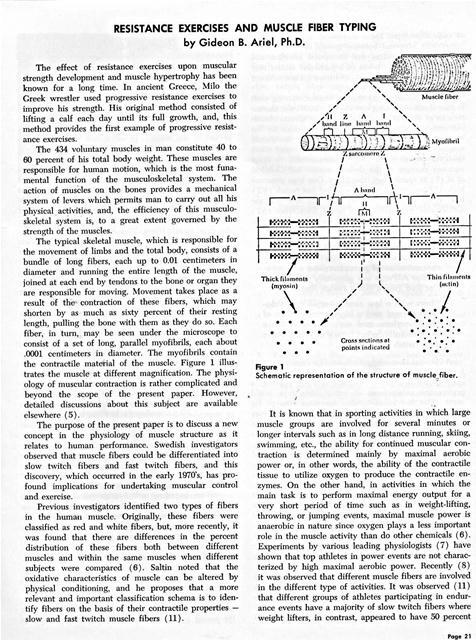 In Muscle as a Tissue, edited by K. Rodahl and S. M. Horvath. New York: McGraw-Hill Book Company, 1960. 3. Kelley, David. 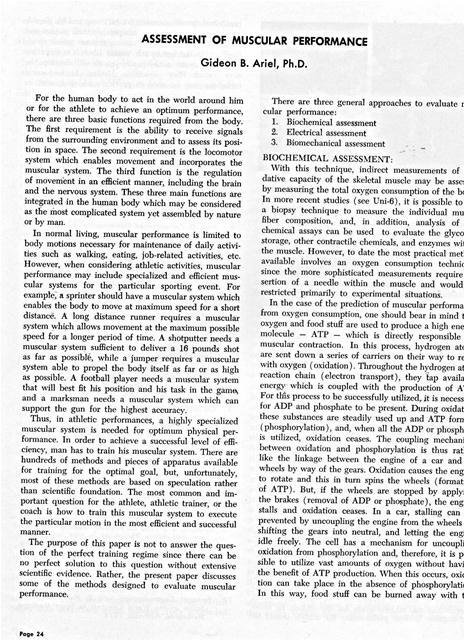 "The Electromotive Characteristics of Muscle", in Kinesiology, edited by Kelley, David New Jersey: Prentice-Hall, Inc., 1971. 4. Liberson, W. T. "Brief Isometric Exercises", in Therapeutic Exercise by S. Licht. Baltimore, Md.. Waverly Press, Inc. 1965.
chives of Phys. Med. and Rehab. 50: 613-620, 1969. 6. Universal Fitness Research Department, Technical Report, Uni-1. 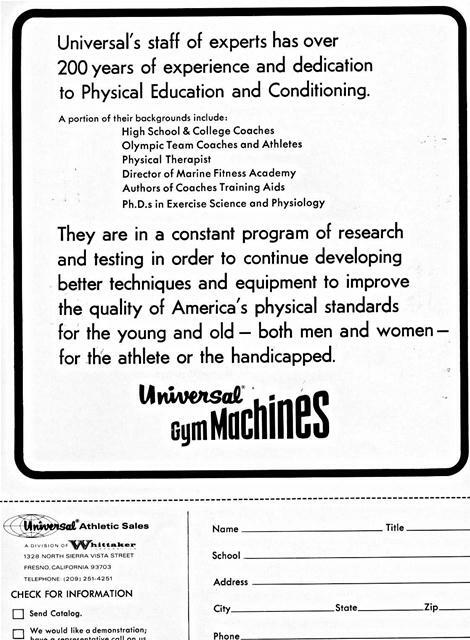 1974.
to Physical Education and Conditioning. for the athlete or the handicapped. 0 We would like a demonstration; hnvp n rPnrpcentntive call on us. "After reviewing various new brands, I have no doubt, Universal is the most superior in versatility and as a workout motivator." Generated on 4/20/2019 3:58:42 PM (PST) ADI/HQ/GBA/2019/ARIELCLOUD/v3.0.2018.0126.